← Crisis in the Coop? The Chickens See Their Shadows…. Today the thermometer hit above 32 degrees F for the first time since late December. Although the flock ventured out during that warm spell, they were unimpressed by the pallid, wispy daylight we had back then. Not so today. The sun not only was bright, it packed heat. After I popped open the little hatch, the two Langshans were the first to poke their heads out. It didn’t take but minutes for the rest to storm the door. Yin the Langshan quickly found her old favorite perch (on the hatch door, you can just see her legs in the photo), and the rest crowded out to feel the sun for the first time since October. 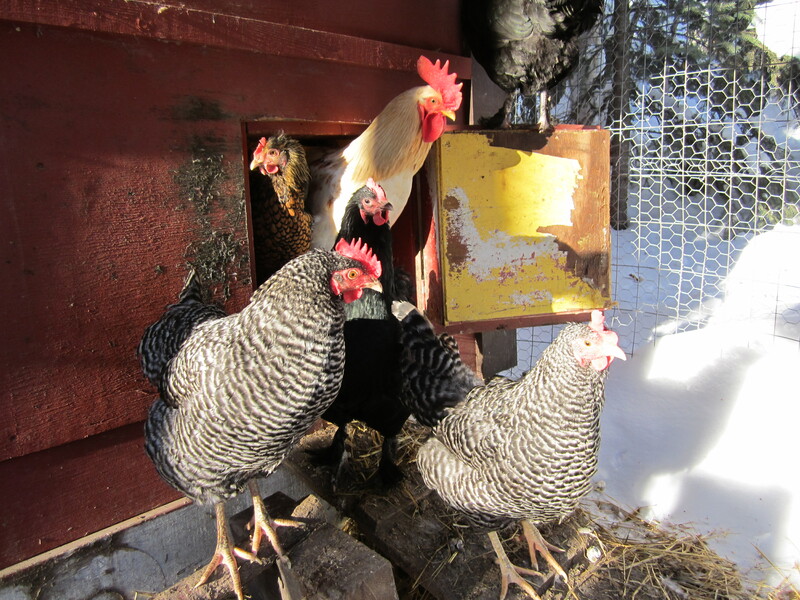 These all are first-year chickens, so this winter was their first extended confinement. The other six hens inside couldn’t be bothered, they have been through five to six winters, and they know very well this is but the first tease of spring. Like a bunch of Florida retirees playing bridge while the youngsters head to the beach on a chilly spring day, the winter veterans stayed put inside the coop foraging in the old straw, while the newbies squinted in the unfamiliar glare of Old Sol. The snow, which in October caused them great discomfiture, barely registers now after five months of being stuck in a 6 x 6 x 8 cubicle. By tomorrow, they will probably have managed to resurrect the dust pit that is right outside the coop door under cover. It was definitely a happy bunch of chickens this afternoon, and it took a lot of coaxing to get them back inside for the evening.